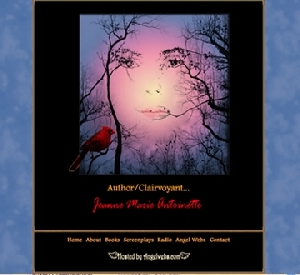 Author/Clairvoyant Jeanne Marie Antoinette. Is dedicated to share the blessings of her Cardinal Healing Insight and inner Visions to help inspire all who desire to become aware of who and what they truly are in life. Jeanne Marie Antoinette is a clairvoyant, author, and artist with an academic background in ancient history, theology, and counseling. For over twenty years, she served as a counselor and clairvoyant in South Florida. As a clairvoyant, she worked nationally helping families, police, and private detectives find missing and murdered children. After relocating, she began a new chapter in her life as an author, publishing her experiences in a number of poignant, powerful books, cards, and screenplays.